Hanover, VA – On Friday, October 28, 2016, at approximately 1:30 p.m., the Sheriff’s Office responded to the Wells Fargo Bank located in the 8100 block of Elm Drive for a reported robbery. The white male suspect approached a teller, displayed a note indicating he was armed, and demanded money. The suspect left the bank with an undisclosed amount of currency. 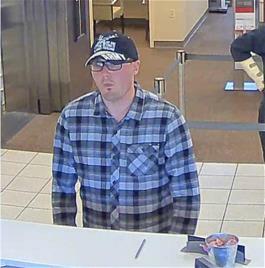 The suspect is described as a white male wearing a black cap with the word “ARMY” on the brim, black eyeglasses, blue and white plaid button down shirt, blue jeans, and black tennis shoes with white soles. This suspect is believed to be the same individual who robbed the Wells Fargo Bank in Henrico County on Tuesday, October 18, 2016.